Yes OSConfig will handle OEM Folders too. 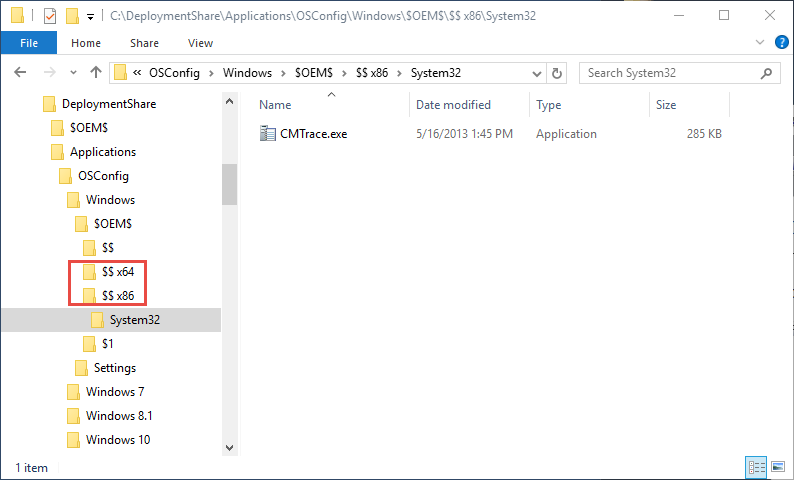 As you can see from the Directory structure, each Operating System in the OSConfig directory can have an $OEM$ directory. In there you have $$ and $1. 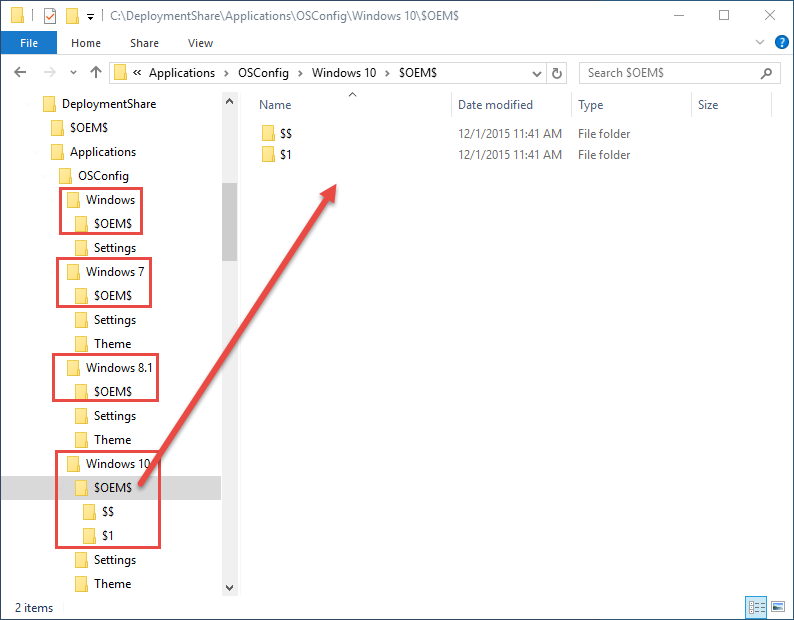 For an understanding of OEM Folders have a look at Understanding Distribution Shares and Configuration Sets. This version of OSConfig only handles the $$ (%WinDir%) and $1 (%SystemDrive%) directories. Adding a file to the $$ directory will copy the file to %WinDir%, and adding a file to $1 will copy the file to %SystemDrive% (typically C:\). Since OSConfig does not support Operating System Architecture directories, some changes to this default have to be made. In the image below under OSConfig\Windows\$OEM$ I have an $$ x64 and a $$ x86 directory. So content that I place in OSConfig\Windows\$OEM$\$$ x86\System32 will be copied to C:\Windows\System32 for all Windows x86 Deployments that I run. This is a great place to inject CMTrace. OSConfig will generate a Robocopy LOG of the file copy. These can be found in C:\Windows\OSConfig\Logs. 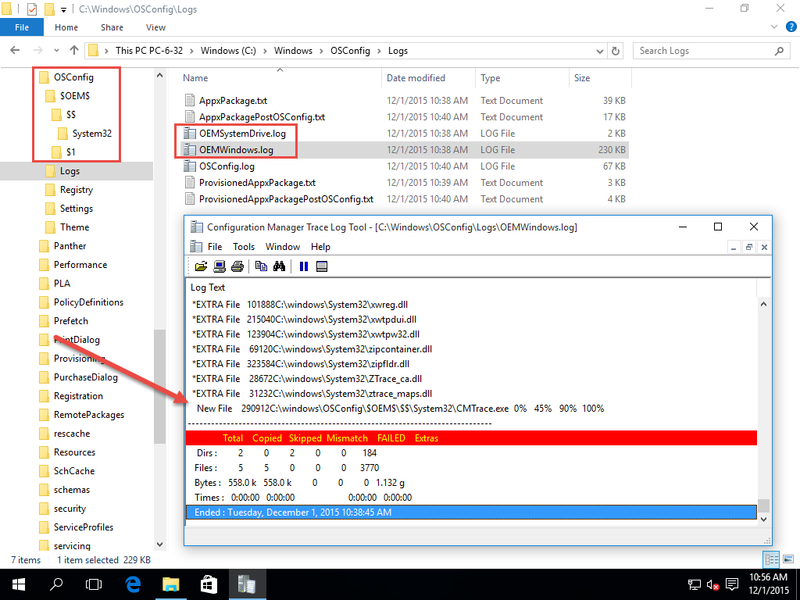 As you can see when viewing the content of the LOG, it will show the files present, and the copied files. Additionally you will see from the Windows\OSConfig\$OEM$ directory structure, it does not reflect the separate directories for $$ x86 and $$ x64. The proper directory is merged into Windows\OSConfig\$OEM$\$$ while the improper one is discarded.